Electronic mail has become a common tool for communication on a personal and professional level. Regrettably, many individuals abandon the same rules of etiquette and professionalism they would apply to a handwritten letter, thus thwarting their opportunity to create a favorable impression. 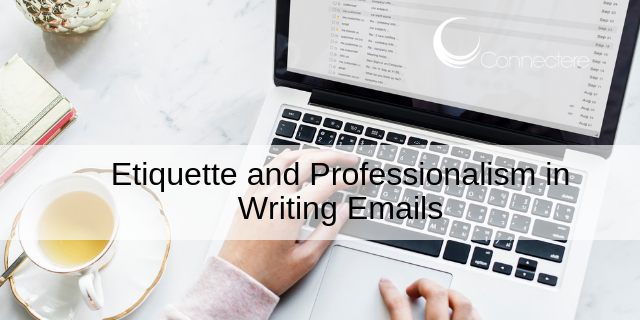 However, by adhering to some basic guidelines, your e-mails can convey the professional image necessary to impress clients, land that job, get that promotion, or build that working relationship. The subject line of your e-mail should be professional, on topic, and devoid of acronyms unless absolutely necessary. The potential reader will undoubtedly have numerous e-mails to peruse, so ensure your subject line grabs their attention and increases the chances of a timely read and response. Make the effort to unearth the name of the individual to whom you are sending the correspondence. This way you can address them personally, avoiding the dreaded “To whom it may concern.” Using the individual’s name creates a certain level of warmth, and it projects your willingness to gather necessary information. Also, be sure to close your e-mail professionally with your full name. Whenever possible, construct the correspondence in a word processing program, then copy and paste the text into an e-mail program. The reason for this is word processors usually have better tools for checking spelling and grammar. Also, most people are more familiar with word processor programs and therefore are more comfortable with the tools and formatting options. Keep your e-mail focused on the subject at hand and be as clear as possible, while still getting your message across to the reader. Unless you’re communicating with a close friend or relative, don’t jump between random subjects or elaborate needlessly. Remember, this is an electronic message, not a novel!